Jean-Luc Godard, À bout de souffle (Breathless) (detail), 1960. Patricia Franchini (Jean Seberg). Eisenstein’s montage of attractions, Tom Gunning’s cinema of attractions, Jean-Luc Godard’s coming attractions: The attraction, Eisenstein wrote in 1923, shortly before he would make his first feature film, Strike, is “every element that can be verified and mathematically calculated to produce certain emotional shocks in a proper order within the totality.” Godard proved the point in his 1960 masterpiecenot Breathless but the Breathless trailer. While Alfred Hitchcock supervised and appeared in several trailers, notably the hilarious coming attractions for Psycho, Godard would seem to be the only major filmmaker who regularly assumed responsibility for cutting (and occasionally shooting) his advertisements for himselfdeveloping a form that was aesthetically more advanced than the features they publicized. Predicated on a rhythm as relentless as that of Tony Conrad’s Flicker, Godard’s Breathless trailer is a barrage of three-second shots with voice-over captions: “the pretty girl,” “the bad boy,” “the revolver,” “the police.” That the voice is female is characteristic of Godard’s trailers (and one of many things that distinguish his from Hollywood’s). The montage of attractions is intermittently interrupted by a title card and the voice of Godard bestowing credit on friends François Truffaut (for the screenplay) and Claude Chabrol (as technical adviser), as well as identifying himself and the movie’s stars. 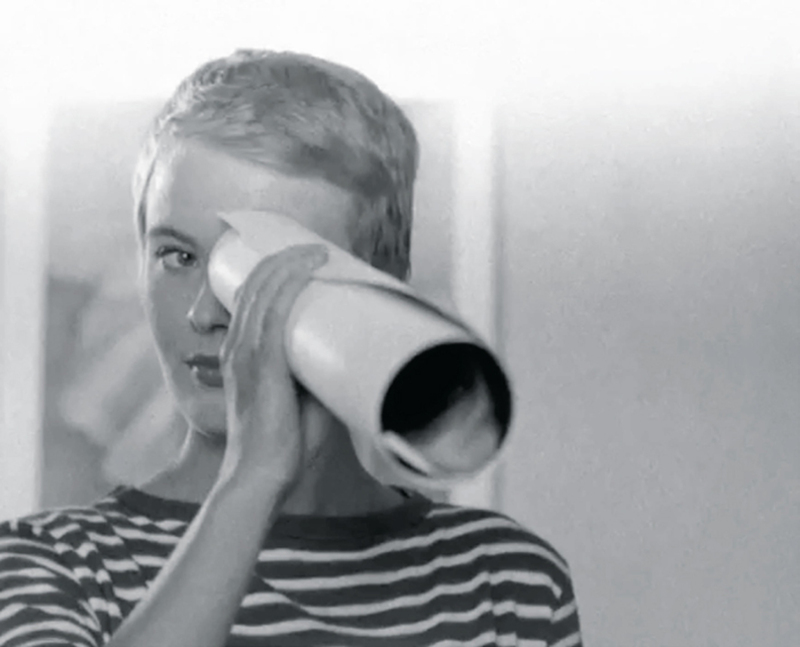 Trailer for Jean-Luc Godard's Breathless (1960). All Godard trailers riff on generic conventions. Somewhat misguidedly, the one for My Life to Live (1962) uses brassy faux jazz, complete with Swingle Singers–type scatting, to hype its austere narrative. The coming attractions for Band of Outsiders (1964) and Alphaville (1965) also eschew voice-over, but to greater effect. The former sets episodes of antic fun violence to rinky-tink ragtime, creating a two-minute precursor to Bonnie and Clyde; the latter uses cheesy menace music to “normalize” its Lemmy Caution adventure as cheap sci-fi. Given the absence of transitions and the separation of sound and image, it’s also pure montage of attractions, as well as an act of film criticism inspiring the desire to see the movie as Godard did. Perhaps everyone should make trailers of the films they most lovebut then again, maybe only if they’re Jean-Luc Godard. A screening of 35-mm prints of a dozen Godard trailers, organized by Jacob Perlin, was one of the highlights of the 2013 New York Film Festival’s retrospective “Jean-Luc Godard: The Spirit of the Forms.” Most of these trailers, in various forms, have been posted to YouTube. J. Hoberman’s Film After Film: Or, What Became of 21st Century Cinema? is newly out in paperback from Verso.